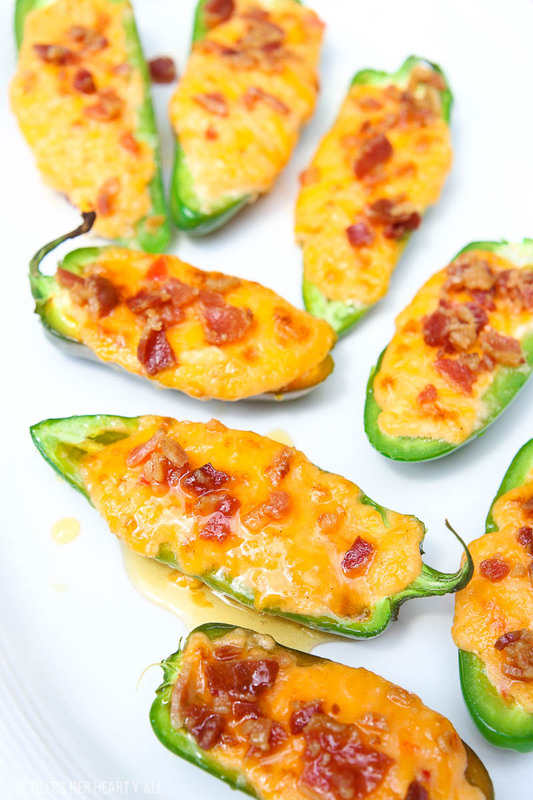 Pimento Cheese Jalapeno Poppers - Sweet & Spicy in just 5 Minutes! 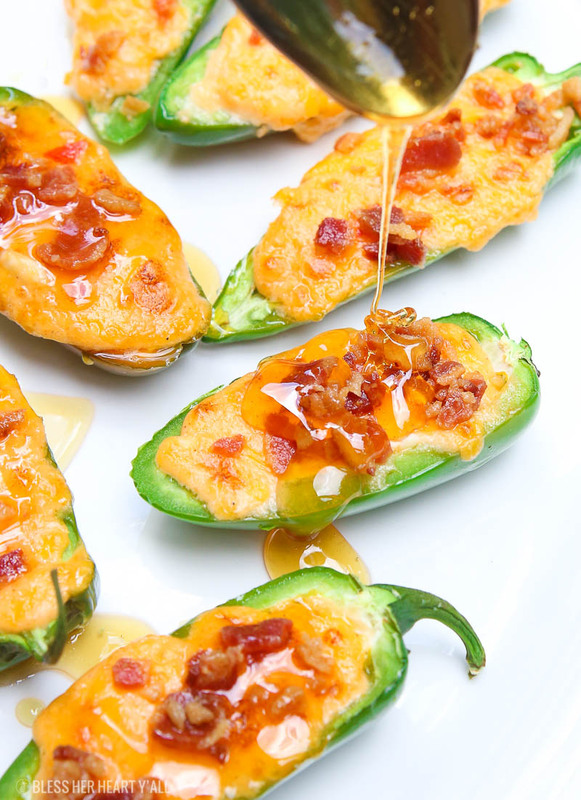 Pimento cheese jalapeno poppers melt fresh jalapenos and pimento cheese together and then top them with crisp bacon crumbles and a drizzle of fresh honey. Each bite combines sweet and spicy with warm melty cheese and crunch. The perfect snack or appetizer in just 5 minutes! 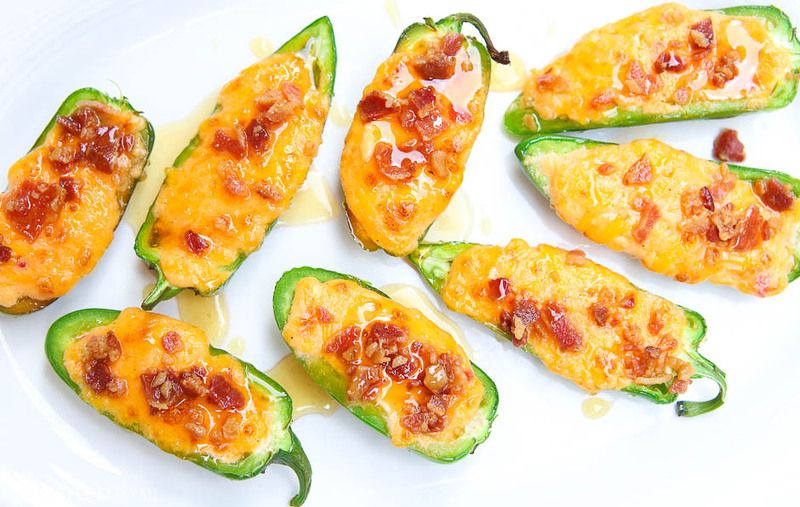 Pimento cheese jalapeno poppers are pretty magical. What’s not to love about colorful finger foods made in just 5 minutes? Crisp jalapenos are sliced in half and deseeded. The seeds are where most of the heat comes from, so make sure you strip away all of the seeds or your mouth will be on fire. 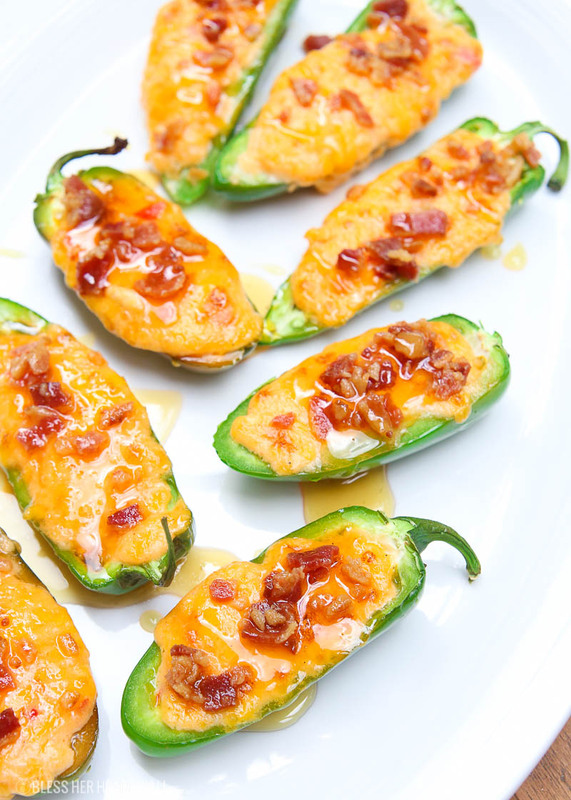 Once the jalapenos are deseeded you are left with crisp slightly-hot outer shells for your poppers. Then there is that delicious pimento cheese. I’ve heard it called “the caviar of the south”. I’d like to think that the south is a little bit more fancy than that, but pimento cheese is pretty amazing down here. What is pimento cheese? It’s a combination of shredded cheddar cheeses, a cream-based mixer like mayo, and red pimento peppers. Down here in the south, we use it as a dip, form it into balls, and other odd things…. but it’s incredibly delicious. 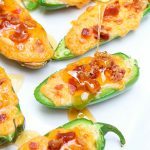 If you don’t think that pimento cheese is your jam, you can sub the pimento cheese out for shredded cheddar cheese in this jalapeno popper recipe. Once you get that savory pimento cheese in each pepper’s core, then you broil them in your oven on high for 2-3 minutes until they are browned. Then immediately take them out of the oven and sprinkle bacon crumbles on top of each popper. This way the cheese is still hot and melty and the bacon crumbles stick into the gooey cheese. Wait too long and the cheese will have hardened and the bacon crumbles will fall right off of each popper. The bacon adds amazing crunch and savory flavors so don’t skimp on this step. I’ve seen jalapeno poppers wrapped in bacon slices before but I really like how simple it is to just sprinkle bacon on top of each pepper instead of trying to wrap a slimy piece of bacon around each jalapeno and securing it with a toothpick. That’s too much work. Keep it simple and use bacon crumbles. Then to top it off, a nice honey drizzle is added to the mix. The honey combats some of the heat and crunch and adds some sweet and gooey-ness to each bite. I need to sneak a thank you in here to my mom, brother, and sister-in-law for the idea behind this recipe. One day I got a string of texts from my family while they were viciously attacking an order of delicious fried pimento cheese fritters at a local Nashville restaurant. They were discussing how I should come up with a similar recipe for the blog. Two minutes later another string of texts popped up on my phone about a pimento cheese jalapeno popper idea as a few of them are slightly obsessed with these goat cheese jalapeno poppers. They then had my attention. And my jealousy for not getting any pimento cheese fritters. Slice each jalapeno in half and deseed each piece. Spoon the pimento cheese into the center of each pepper half and place on a baking sheet. Broil on high for 2-3 minutes or until the cheese is melted and the edges are turning brown. Remove from the oven and immediately sprinkle with bacon crumbles while the cheese is still melty. Then allow the peppers to cool. Once cool, drizzle each pepper with honey and enjoy! This is my favorite pimento cheese (and it’s gluten-free!). Try the original version, it’s delicious. This is my go-to small baking sheet. It’s the perfect size for putting jalapeno poppers on. Not all honey is the same. Fresh is best. But if you need a recommendation for a substitute, I’d recommend this honey.